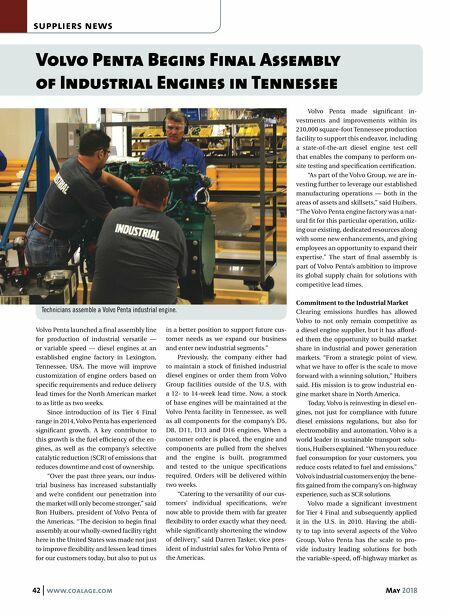 42 www.coalage.com May 2018 suppliers news Volvo Penta Begins Final Assembly of Industrial Engines in Tennessee Volvo Penta launched a final assembly line for production of industrial versatile — or variable speed — diesel engines at an established engine factory in Lexington, Tennessee, USA. The move will improve customization of engine orders based on specific requirements and reduce delivery lead times for the North American market to as little as two weeks. Since introduction of its Tier 4 Final range in 2014, Volvo Penta has experienced significant growth. A key contributor to this growth is the fuel efficiency of the en- gines, as well as the company's selective catalytic reduction (SCR) of emissions that reduces downtime and cost of ownership. "Over the past three years, our indus- trial business has increased substantially and we're confident our penetration into the market will only become stronger," said Ron Huibers, president of Volvo Penta of the Americas. "The decision to begin final assembly at our wholly-owned facility right here in the United States was made not just to improve flexibility and lessen lead times for our customers today, but also to put us in a better position to support future cus- tomer needs as we expand our business and enter new industrial segments." Previously, the company either had to maintain a stock of finished industrial diesel engines or order them from Volvo Group facilities outside of the U.S. with a 12- to 14-week lead time. Now, a stock of base engines will be maintained at the Volvo Penta facility in Tennessee, as well as all components for the company's D5, D8, D11, D13 and D16 engines. When a customer order is placed, the engine and components are pulled from the shelves and the engine is built, programmed and tested to the unique specifications required. Orders will be delivered within two weeks. "Catering to the versatility of our cus- tomers' individual specifications, we're now able to provide them with far greater flexibility to order exactly what they need, while significantly shortening the window of delivery," said Darren Tasker, vice pres- ident of industrial sales for Volvo Penta of the Americas. 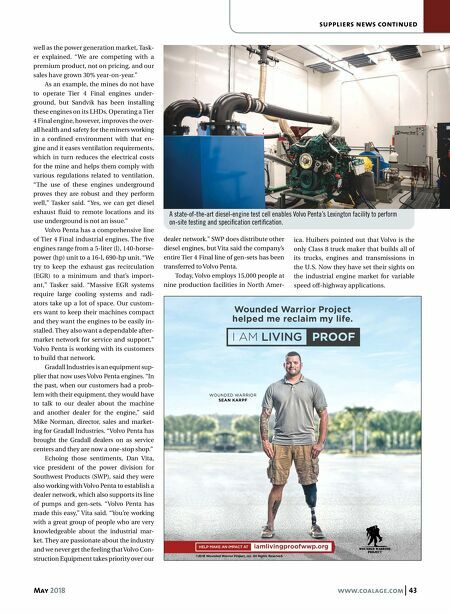 Volvo Penta made significant in- vestments and improvements within its 210,000 square-foot Tennessee production facility to support this endeavor, including a state-of-the-art diesel engine test cell that enables the company to perform on- site testing and specification certification. "As part of the Volvo Group, we are in- vesting further to leverage our established manufacturing operations — both in the areas of assets and skillsets," said Huibers. "The Volvo Penta engine factory was a nat- ural fit for this particular operation, utiliz- ing our existing, dedicated resources along with some new enhancements, and giving employees an opportunity to expand their expertise." The start of final assembly is part of Volvo Penta's ambition to improve its global supply chain for solutions with competitive lead times. Commitment to the Industrial Market Clearing emissions hurdles has allowed Volvo to not only remain competitive as a diesel engine supplier, but it has afford- ed them the opportunity to build market share in industrial and power generation markets. "From a strategic point of view, what we have to offer is the scale to move forward with a winning solution," Huibers said. His mission is to grow industrial en- gine market share in North America. Today, Volvo is reinvesting in diesel en- gines, not just for compliance with future diesel emissions regulations, but also for electromobility and automation. Volvo is a world leader in sustainable transport solu- tions, Huibers explained. "When you reduce fuel consumption for your customers, you reduce costs related to fuel and emissions." Volvo's industrial customers enjoy the bene- fits gained from the company's on-highway experience, such as SCR solutions. Volvo made a significant investment for Tier 4 Final and subsequently applied it in the U.S. in 2010. Having the abili- ty to tap into several aspects of the Volvo Group, Volvo Penta has the scale to pro- vide industry leading solutions for both the variable-speed, off-highway market as Technicians assemble a Volvo Penta industrial engine.